Early spring is apparently a good time to look for shipwrecks in Lake Michigan. Earlier this month, a helicopter from the Coast Guard’s Air Station in Traverse City, Michigan, was out on a routine patrol over the lake, looking for boats in distress or anything out of the ordinary. It was a calm day; the ice that covered the lake had recently melted, and the water was still very cold, just 38 degrees Fahrenheit — a perfect combination for good visibility. 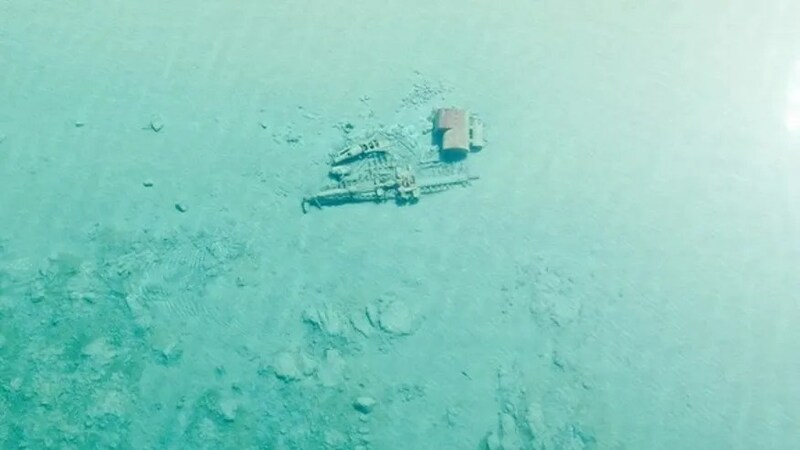 Brown snapped several pictures of the Lake Michigan wrecks with his iPhone. The Coast Guard posted the photos to Facebook, and they quickly went viral. “We didn’t expect these photos to catch on like they did,” Schrader said. In the last week, he’s gotten calls from reporters as far away as Norway and China. The photos didn’t reveal any new shipwrecks, but they did offer new views of vessels that sank up to 150 years ago. For example, the aircrew captured a shot of a 133-foot-long wooden steamer named Rising Sun that ran aground in shallow water just north of Pyramid Point on October 29, 1917, during an early season snowstorm. Some of Brown’s photos also revealed the 121-foot-long brig James McBride, which was stranded near Sleeping Bear Point during a storm on October 19, 1857, while carrying wood to Chicago. Both of those ships are located in the Manitou Passage, which was a major shipping area in the heyday of Michigan lumbering, according to the Michigan Underwater Preserve Council (MUPC). Ships sought safety in the waters around the Manitou islands during storms, but clearly not all of them were successful. The historic wrecks are protected under state law, and divers should know that it is a felony to remove or tamper with artifacts in Michigan’s Great Lakes, according to the MUPC. Anyone who tries to take a porthole, anchor or other object from a wreck could face two years in prison and hefty fines.